Lucchini, Keller 22.9.2015 :: NCCR MUST :: Are the laws of optics still valid at the ultimate scaling limits of electronic and optoelectronic devices? Are the laws of optics still valid at the ultimate scaling limits of electronic and optoelectronic devices? The laws of optics describing phenomena such as reflection or refraction are very well tested and established. However, they essentially describe the macroscopic and quasi-static response of matter to the electromagnetic light fields. While this view provides the correct description for most applications, the question arises whether the same optics laws can also be transferred to atomic length and time scales, which represent the ultimate scaling limits of electronic and optoelectronic devices. 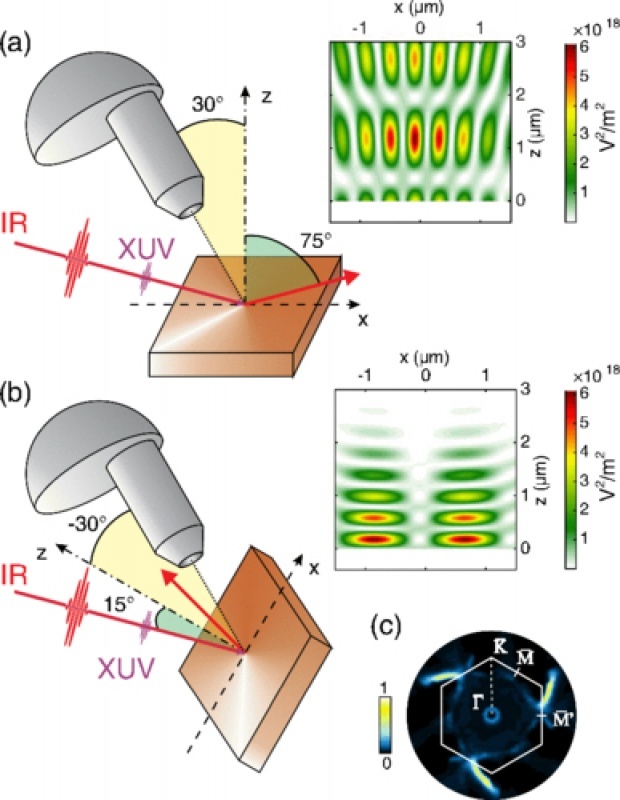 In a joint experiment between the Hengsberger/Osterwalder group from the University of Zurich and the Keller group from ETH Zurich, the phase of an infrared field reflected from a metal surface was probed with atomic length and attosecond time resolution. It was found that the phase shift experienced upon reflection from the surface is still correctly described by Fresnel’s reflection law even on these extreme scales. In addition, the experiment showed very efficient screening of the light field at the vacuum-metal interface (Ångström scale screening depth), which confirms that the mathematically abrupt boundaries assumed in optics laws yield the correct macroscopic picture. The paper was selected by PRL as an Editors' Choice. Figure 1. Photoemission electron detection geometry using two angles of incidence for the infrared probe field with ΘIR = 75º (a), and 15° (b). The contour plots show the intensity of the IR transient grating in V2/m2 for the xz plane when the pulse maximum impinges on the surface. (c) Fermi surface map of Cu(111) recorded with He Iα (hv = 21.2 eV). The white hexagon indicates the borders of the surface Brillouin zone.